Hello hello again to my readers and if you are new to my blog welcome welcome! Thanks for coming by and reading my other posts. So you might be wondering why is there such a huge gap on my blogging posts like after 3 months? I've been very busy with uni so I don't really have that time to blog and post new things, however, I was still active on snapchat, twitter and instagram just slacking on the blogging world though :( When I finally had a break from university life, I started on catching up on my favourite blogs and I just thought 'I miss blogging'. My friend captaineverland has returned and has been very active on blogging recently as I was reading her blog, I came across one post that would be very interesting to do which is the Two Weeks Open Letter Challenge, however, I had thoughts about whether to do it or not but eventually here I am writing about it and about to do it! Exciting right? So here it is, I grabbed the photo from my friend's blog and do check out her letters too. 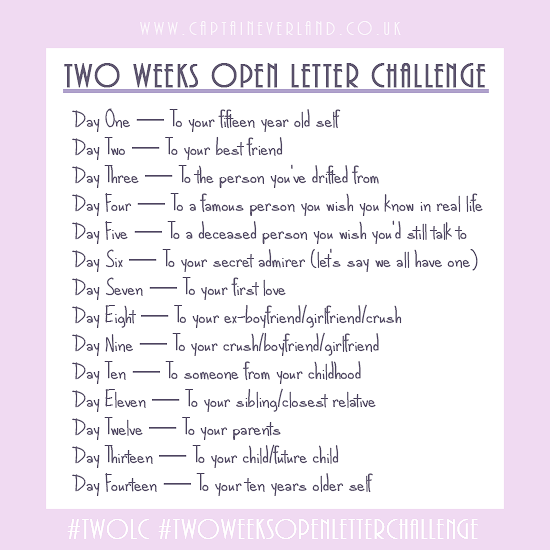 For two weeks, a letter a day has to be written but I'm not sure if will I be able to write on a daily basis but I will do my best. This is something I would like to read in 1 years time or 5 years time or even in 10 years, it would be amazing what I would be doing then. So do join in and comment below so I can have a read of yours too!